Our organically crafted Mango Kernel Butter is cold pressed from the woody kernels of colorful Mangoes (Magnificera Indica) and gently refined to produce a creamy, skin regenerative butter that has a rich, silky texture and a mild, slightly nutty aroma. Mango Kernel Butter has long been used in the rain forests and tropical regions of the world for its skin softening, soothing, moisturizing, and protective properties. 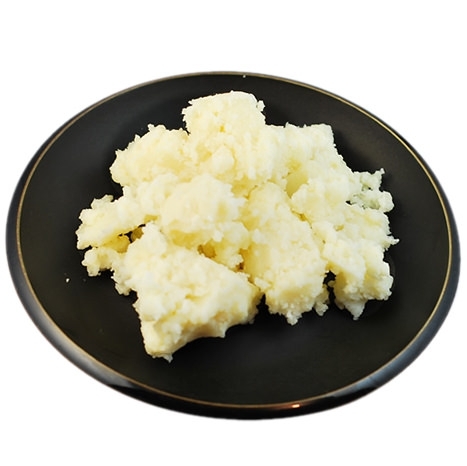 Mango Butter is an extremely versatile ingredient, perfect for use as-is or in almost any skin or hair care recipe. Mango Butter's subtle, almost non-existent aroma is perfect alternative to butters like Cocoa or Shea that have more pronounced characteristic smells. Those with a very strong nose may pick up a subtle notes of fruit and fatty acids, but that aroma doesn't tend to linger on the skin on application and is easily overcome by essential oils, infused herbs, or other aromatic ingredients. Loaded with Vitamins like A, C and E, essential fatty acids, and natural antioxidants, Mango Butter helps reduce the appearance of fine lines and wrinkles and increasing skin's overall youthful look. It's rich in Oleic Acid, a mono-unsaturated omega-9 acid; and Stearic Acid, a saturated fatty acid. These are ingredients that the skin readily recognizes and absorbs, keeping it soft and supple. The rich, nourishing nature of Mango Butter can even help benefit those suffering from skin conditions such as eczema or psoriasis. It even provides light protection against harmful UV rays. Mango Butter can even be used as a main ingredient in homemade soaps producing a hard bar with a stable, conditioning lather.